Ductac at Mall of the Emirates, Dubai, 19th March 2015. Our inaugural exhibition, Public Privacy, features six young artists chosen for their dedication to their practice and process for mediating the conflict between the public and private spheres through their work. To examine this contradiction of public and private dimensions, curators Cristiana de Marchi and Mohammed Kazem, queried their selected artists on the conveyance of messages and content within their society, and how they might address critical issues within this framework. The fluid perspective offered by these artists as they navigate the roles and limitations in a society simultaneously dominated by traditional values and influenced by Western social norms & patterns, underpins the work showcased in this exhibition. The national character of the UAE while distinct, is nonetheless home to many nationalities which have left their mark on the Emirati culture. To address this reality, Public Privacy draws broadly from the Gulf region and the subcontinent. 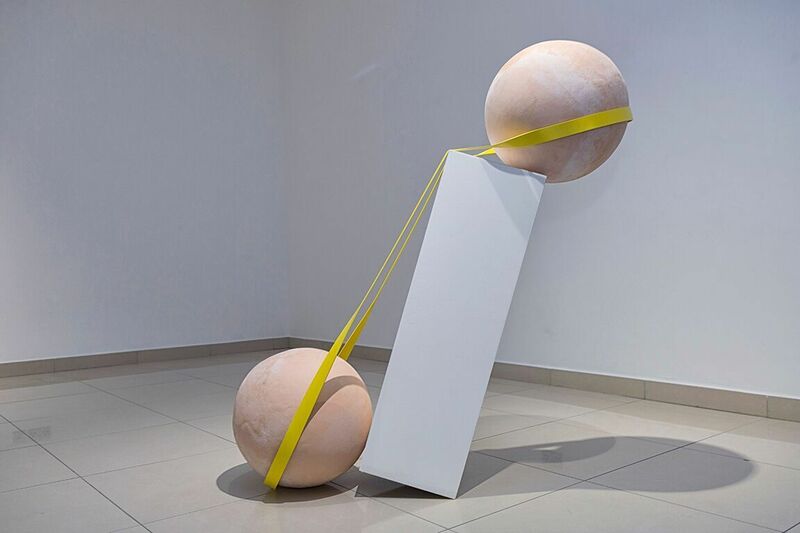 A wide range of disciplines represent the trending interdisciplinary aspects of the art scene in the UAE, and its ever-increasing role in the global art community. 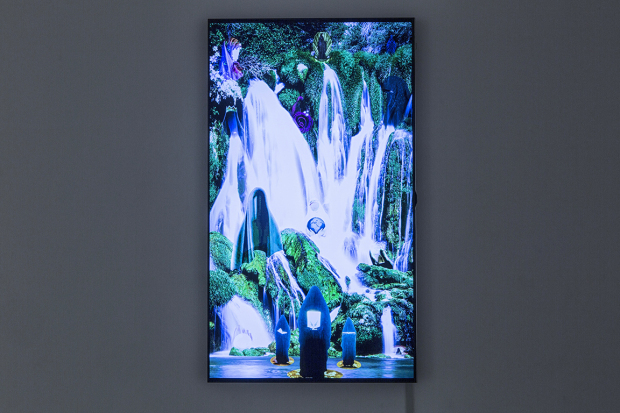 Displaying a variety of media, techniques, and practice to express the concerns, perspectives and worldview of the emerging generation, the exhibition also probes the relationship between the artist and the audience. An often uneasy personal inquiry into self-positioning within zones of operation, required the participants to find a balance between artistic choices and deeply rooted social mores. Each artist offers a unique perspective and method for conveying their content and message to their audience. 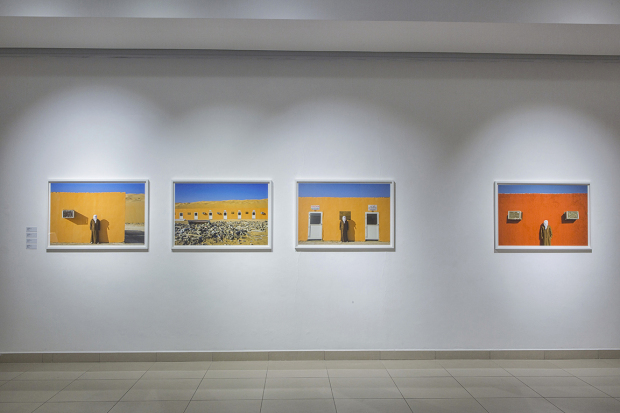 Emirati artist Hamad Al Falasi’s photographic series, “Local Reciprocal” comments on the rapid socio-economic transformation in his country. The artist appears in the images with his headscarf covering his face, thus playing with the idea of public and private space, and of facing or not facing change. Kuwaiti artist Monira Al Qadiri explores changing ideas of morality in the region through visual imagery in spiritual popular culture and employs images culled from social media that represent new templates for morality, especially with regards to women. UAE-based Indian artist Vikram Divecha’s work comments on the urban landscape, compelling viewers to think about familiar sights that often go unnoticed. His installation, “Negative Heaps (of designated waste)” focuses on the murals decorating the walls of underpasses in Dubai’s ever expanding network of roads and flyovers. Jumairy, the youngest artist in the show presents an intimate, thought provoking interactive installation, in which visitors are invited to switch on torches and read the words and phrases that become visible on the glass. The words represent shared secrets that evoke narratives, left to the imagination of every viewer.